(17/P83) TRENTON – Commissioner Bob Martin announced today that the Department of Environmental Protection is awarding almost $400,000 in grants to 18 municipalities in 10 counties across the state to promote robust stewardship of community trees and forests. “I’m pleased to have these grants going to the communities and locations that cherish our trees and do the hard work necessary to ensure the Garden State will always have these important resources available for this and future generations,” said Commissioner Martin. 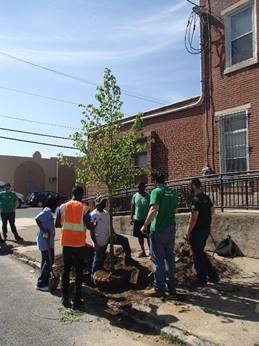 The 18 awards are being issued by the New Jersey Forest Service’s Urban and Community Forestry program (NJUCF) through Community Stewardship Incentive Program (CSIP) grants. The grant program focuses upon the communities’ implementation of NJUCF approved Community Forestry Management Plans. The 2017 CSIP grants are funded by the “Treasure Our Trees” state license plate fund and the No Net Loss Reforestation program. Communities in Bergen, Cape May, Essex, Gloucester, Mercer, Middlesex, Monmouth, Morris, Passaic and Somerset Counties were recipients of this year’s grants. The NJUCF CSIP grants allow local governments to actively manage for Emerald Ash Borer (EAB) by conducting inventories to identify ash trees in their communities, develop EAB mitigation plans, and to reforest their communities to compensate for ash trees which are removed, Sacco explained. The greatest numbers of ash trees are found in central and northern New Jersey and 54 communities in 12 counties have had EAB detections since the first detection of the invasive pest in Somerset County in 2014. Grants range from $10,000 to $30,000 for work on projects from community tree inventory and ash surveys to reforestation and tree planting. Resiliency planning grants of $10,000 have been awarded to the following municipalities: Woodbury (Gloucester County), Hamilton Township (Mercer County), Long Branch, Millstone (Monmouth County), and Clifton (Passaic County). Reforestation/Tree Planting grants totaling $341,741have been awarded to: Bogota, Ramsey, River Edge, South Hackensack (Bergen County), Avalon (Cape May County), West Orange (Essex County), Princeton (Mercer County), East Brunswick (Middlesex County), Shrewsbury, Spring Lake (Monmouth County), Mountain Lakes (Morris County), Pompton Lakes (Passaic County), and Montgomery Township (Somerset County). For more information, please visit the NJ Urban and Community Forestry Program at www.communityforestry.nj.gov and like NJDEP Urban & Community Forestry on Facebook. 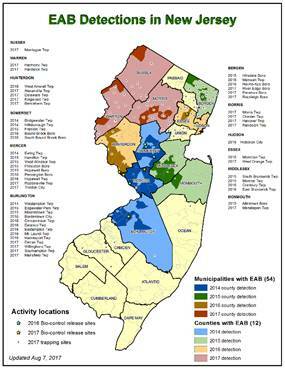 Visit the NJ Emerald Ash Borer Task Force website, www.emeraldashborer.nj.gov, to find out how communities and property owners can address the threat posed to our ash trees by the Emerald Ash Borer.